Crazy Good Turns is a podcast that celebrates good deeds of all kinds. Episodes so far include a program to send military veterans to the world's disaster zones, a preacher who was "conned by God" to provide inspiration and support in a troubled city, a sort of Johnny Appleseed of children's playgrounds, and a family who created a program to help first responders in memory of a brother who died on 9/11. They do a good deed of their own by including music from emerging and innovative performers in the podcast. As William Saroyan said, "Seek goodness everywhere, and when it is found, bring it out of its hiding place and let it be free and unashamed." 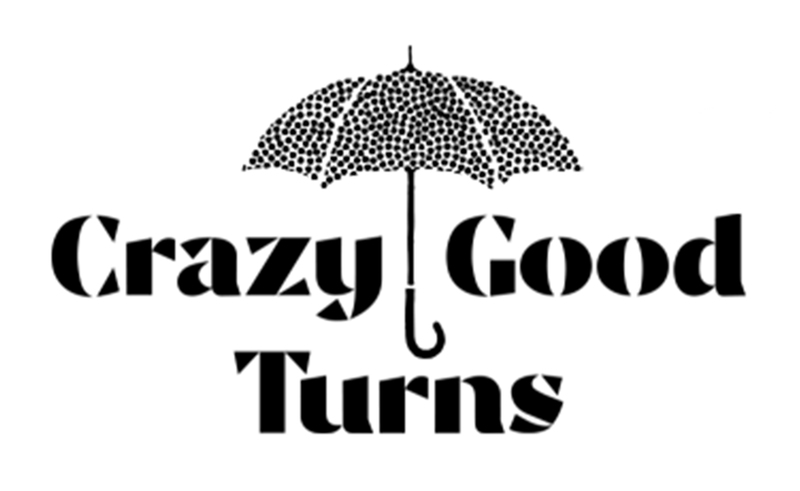 In an interview, the creators of the Crazy Good Turns podcast talked about what inspires good deeds, why good intentions do not always succeed, and the importance of saying thank you. Was there a time someone did you a crazy good turn? Many times. But here is one that had a lasting impact: Years & years ago, I worked in the office of then-Vice President George H.W. Bush. I did not have an important job in his office, and he would have had barely any reason to notice me. During that time period, my two year old daughter died. I received a very thoughtful and kind note from the Vice President. I learned two things from his note that I've carried with me for the rest of my life: First, the importance of writing personal notes to people, not just friends and relatives, but the people who work for you (at whatever level) and whose paths you cross. When I was the CEO of Home Depot, I would spend every Sunday writing notes to hourly associates, thanking them personally for things they had done for customers or others. That habit went back to the note from the Vice President. Second, I learned that bosses do a great kindness by acknowledging the personal grief of those who work for them. Crazy good? It felt that way. What inspires people to acts of exceptional kindness and generosity? Is it religious teaching? Family culture? Their own experience of being helped? All of the above. But I hope it is also spurred by seeing and hearing what other, incredibly generous and kind people have done. That is the spirit behind Crazy Good Turns. We want to celebrate the amazing things people do for others. We learn what we value by what we celebrate. Why do some efforts to help fail badly? One of my favorite lines in literature is from Ring Lardner: "Daddy, are we lost?" "Shut up, he explained." Sometimes our efforts to help can reflect that dialogue. We don't listen and/or we think we're helping when what we're truly doing is trying to impose our will. And, of course, the law of unintended consequences applies - always. Where do you find the examples of crazy good turns? So far, it's been a combination of tapping into the great nonprofits we got to know through Home Depot's philanthropic efforts, suggestions from others and research through the Internet. Now that we're live, we're starting to get some interesting story submissions from listeners that we're already researching for season two, which was our hope from the start. What makes them crazy? What makes them good? The craziness almost always stems from the founder. We point out in our City of Refuge episode that there's just something sort of crazy about someone who starts a nonprofit. They spot some need or pressing problem in the world and are crazy enough to think they can fix it. And often they actually do, or at least make a dent. And the goodness comes from their hearts. What is the best way to thank someone for an act of extraordinary kindness? Simply saying "thank you." Not enough people do. Why a podcast? What does that format provide? First, it's a rapidly growing medium that will only continue to ramp up with the ubiquity of the Internet, particularly in cars. The audio format is perfect for storytelling, which at its core is what we do. Finally, we saw a need out there. While there are well over 100,000 podcasts, not one focused on telling the vivid backstories of nonprofits and people who do amazing things for others, which we think are important and inspiring stories to tell. Where do you find the music and what do you look for? We work with a great firm in Los Angeles called Score A Score. They score music for films, commercials, corporate videos, etc., using a pretty interesting proprietary technology they developed. They vet the artists, work with us on music selection and provide the final audio mix. Like our episodes, we're looking for diversity but also accessibility. You won't hear any death metal, but definitely some good folk, alternative, hip hop, reggae and such. And, similar to the stories we're getting from listeners, we're now getting a number of submissions from bands that we intend to feature in season two. While podcast audiences generally skew to a younger demographic and many are pretty niche-y, we're trying to cast a wide, more mainstream net because we think our stories have widespread appeal. That appears to be the case from the early data we're seeing. Crazy Good Turns is available on iTunes and Stitcher.